In vascular plants, the root is that organ of a plant body that typically lies below the surface of the soil (though not always) and whose major functions are to absorb water and inorganic nutrients and to anchor the plant body to the substrate. A root can also be aerial (that is, growing above the ground) or aerating (that is, growing up above the ground or especially above water). 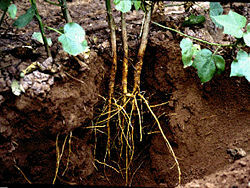 Similarly, a stem called a rhizome grows horizontally below the surface of the soil, but it differs from a root in that it contains nodes from which roots sprout, and it does not absorb nutrients or water. An analogy is sometimes drawn between roots, which function in absorbing nutrients for the plant, with the human digestive system, which functions in absorbing food for the human body. Similarly, plant leaves have been compared to the human lungs, and the xylem and phloem of the vascular system to the veins and arteries of the human circulatory system. These analogies are more than chance comparisons, since some religions, particularly Western theologies, commonly view human beings as "microcosms of creation" (Burns 2006). Such theologies hold that human beings resemble the Supreme Being, while all life resembles the image and likeness of the human character and form. At the tip of every growing root is a conical covering of tissue called the root cap. It usually is not visible to the naked eye. It consists of undifferentiated soft tissue (parenchyma) with unthickened walls covering the apical meristem, tissue at the root tip responsible for root growth. The root cap provides mechanical protection to the meristem cells as the root advances through the soil, its cells worn away but quickly replaced by new cells generated by cell division within the meristem. The root cap is also involved in the production of mucigel, a sticky mucilage that coats the new formed cells. These cells contain statoliths, starch grains that move in response to gravity and thus control root orientation. The outside surface of a root is the epidermis, an outer single-layered group of cells covering the young tissues and leaves of a plant. Recently produced epidermal cells absorb water from the surrounding environment and produce outgrowths called root hairs that greatly increase the cell's absorptive surface. Root hairs are very delicate and generally short-lived, remaining functional for only a few days. However, as the root grows, new epidermal cells emerge and these form new root hairs, replacing those that die. The process by which water is absorbed into the epidermal cells from the soil is known as osmosis. Because of the nature of osmosis, saline water is more difficult for most plant species to absorb. Beneath the epidermis is the cortex, which comprises the bulk of the root. Its main function is storage of starch. Intercellular spaces in the cortex aerate cells for respiration. An endodermis is a thin layer of small cells forming the innermost part of the cortex and surrounding the vascular tissues deeper in the root. The tightly packed cells of the endodermis contain a substance known as suberin and create an impermeable barrier of sorts. Water can only flow in one direction through the endodermis: In towards the center of the root, rather than outward from the stele (the central part of the root) to the cortex. The stele consists of the cells inside the endodermis. The outer part, known as the pericycle, surrounds the actual vascular tissue. In monocotyledonous plants, the xylem and phloem cells are arranged in a circle around a pith or center, whereas in dicotyledons, the xylem cells form a central "hub" with lobes, and phloem cells fill in the spaces between the lobes. Early root growth is a function of the apical meristem located near the tip of the root. The meristem cells more or less continuously divide, producing more meristem, root cap cells (these sacrificed to protect the meristem), and undifferentiated root cells. The latter will become the primary tissues of the root, first undergoing elongation, a process that pushes the root tip forward in the growing medium. Gradually these cells differentiate and mature into specialized cells of the root tissues. Roots will generally grow in any direction where the correct environment of air, nutrients, and water exists to meet the plant's needs. Roots will not grow in dry soil. Over time, given the right conditions, roots can crack foundations, snap water lines, and lift sidewalks. At germination, roots grow downward due to gravitropism, the growth mechanism of plants that also causes the shoot to grow upward. In some plants (such as ivy), the "root" actually clings to walls and structures; this is known as thigmotropism, or response to touch. Most plants experience growth only along the apical meristems; this is known as primary growth, which encompasses all vertical growth. On the other hand, secondary growth encompasses all lateral growth, a major component of woody plant tissues. Secondary growth occurs at the lateral meristems, namely the vascular cambium and cork cambium. The former forms secondary xylem and secondary phloem, while the latter forms the periderm, found only in woody plants. In woody plants, the vascular cambium, originating between the xylem and the phloem, forms a cylinder of tissue along the stem and root. The cambium layer forms new cells on both the inside and outside of the cambium cylinder, with those on the inside forming secondary xylem cells, and those on the outside forming secondary phloem cells. As secondary xylem accumulates, the "girth" (lateral dimensions) of the stem and root increases. As a result, tissues beyond the secondary phloem (including the epidermis and cortex, in many cases) tend to be pushed outward and are eventually "sloughed off" (shed). At this point, the cork cambium (this process only occurs in woody plants) begins to form the periderm, consisting of protective cork cells containing suberin. In roots, the cork cambium originates in the pericycle, a component of the vascular cylinder. The vascular cambium produces new layers of secondary xylem annually. This dead tissue is responsible for most water transport through the vascular tissue (systems and roots). A true root system consists of a primary root and secondary roots (or lateral roots). The taproot: The primary root is prominent and has a single, dominant axis; there are fibrous secondary roots running outward. Usually allows for deeper roots capable of reaching low water tables. Most common in dicots. The primary root is not dominant: The whole root system is fibrous and branches in all directions. Most common in monocots. Adventitous roots arise from the stem and not from another root. They usually occur in monocots and pteridophytes, but also in a few dicots, such as strawberry (Fragaria vesca) and white clover (Trifolium repens). The roots, or parts of roots, of many plant species have become specialized to serve adaptive purposes besides the two primary functions described in the introduction. 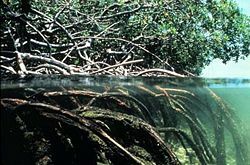 Aerating roots (or pneumatophores): Roots rising above the ground, especially above water, such as in some mangrove genera (Avicennia, Sonneratia). Aerial roots: roots entirely above the ground, such as in ivy (Hedera helix) or in epiphytic orchids. They function as prop roots or anchor roots. Contractile roots: They pull bulbs or corms of monocots deeper in the soil through expanding radially and contracting longitudinally. They show a wrinkled surface. Haustorial roots: roots of parasitic plants that can absorb water and nutrients from another plant, such as in mistletoe (Viscum album) and Rafflesia. Proteoid roots or cluster roots: Dense clusters of rootlets of limited growth that develop under low phosphate or low iron conditions in Proteaceae and some plants from the following families Betulaceae, Casuarinaceae, Eleagnaceae, Moraceae, Fabaceae, and Myricaceae. 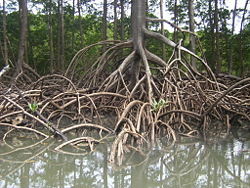 Stilt roots: these are adventitious support roots, common among mangroves. They grow down from lateral branches, branching in the soil. Tubiferous roots: A portion of a root forms into a roundish knob called a (tuber) for food. 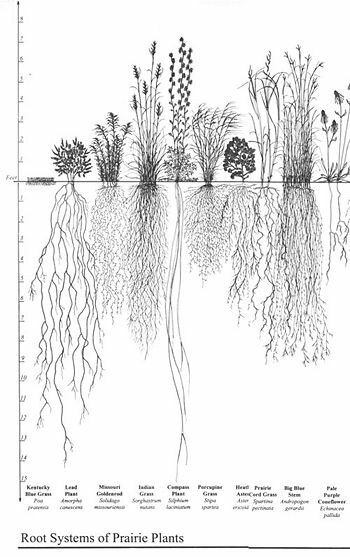 The distribution of vascular plant roots within the soil depends on the plant life form, the spatial and temporal availability of water, and nutrients in the soil. The deepest roots are generally found in deserts and temperate coniferous forests; the shallowest in tundra, boreal forest, and temperate grasslands. The deepest observed living root, at least 60 meters below the ground surface, was observed during the excavation of an open-pit mine in Arizona. Brundrett, M. C. 2002. Coevolution of roots and mycorrhizas of land plants. New phytologist 154(2):275-304. Burns, C. P. E. 2006. Altruism in nature as manifestation of divine energia. Zygon 41(1):125-137. Chen, R., E. Rosen, and P. H. Masson. 1999. Gravitropism in Higher Plants. Plant Physiology 120(2):343-350. Phillips, W. S. 1963. Depth of roots in soil. Ecology 44(2):424. Raven, J. A., and D. Edwards. 2001. Roots: evolutionary origins and biogeochemical significance. Journal of Experimental Botany 52 (Suppl 1):381-401. Schenk, H. J., and R. B. Jackson. 2002. The global biogeography of roots. Ecological Monographs 72(3):311-328. This page was last modified on 4 April 2008, at 00:40.